I designed the Hawbuck Lean wallet because no matter how vigilant I was about de-cluttering my leather wallet, it never felt comfortable. I cycle to work, so my wallet would go in my bag rather than my back pocket. At work, I'd put it on my desk rather than sit on it—back at home I'd realize I left my wallet on my desk. This wasn't working, so I emptied out my wallet and pulled out my calipers—9.8mm thick, empty—3/8 inch. That’s crazy. It also weighed 55 grams--- not lightweight. 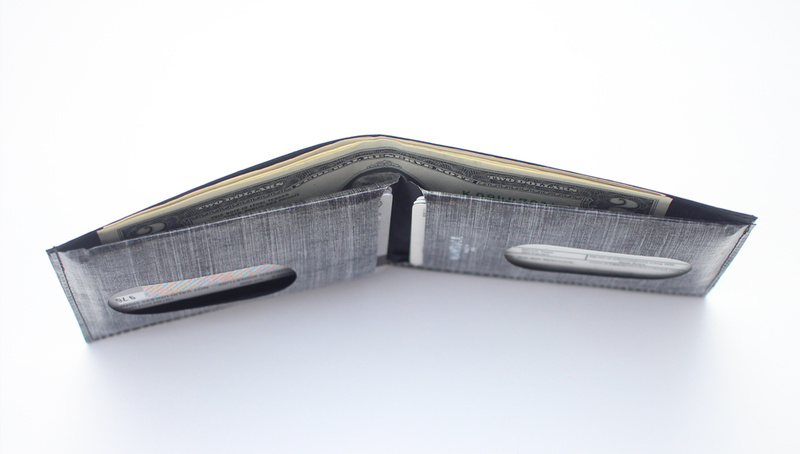 This is an ordinary bi-fold leather wallet from a well-regarded leather company. So I began prototyping Cuben fiber wallets that were stripped down to the minimum. Once I started using this extremely minimal wallet, there was no going back. I've continued to refine the design, and am proud of where it is now. It's unlike any other DCF wallet out there, I've rigorously pared the design to the essential, the least. I'm tempted to do like the mattress industry--- something like "try it for 30 days and if you don't love it..."
While leather wallets often are focused on the leather, I think the Hawbuck Lean Wallet isn't about the DCF material, it's about a wallet that's almost not there. It puts the material to work.